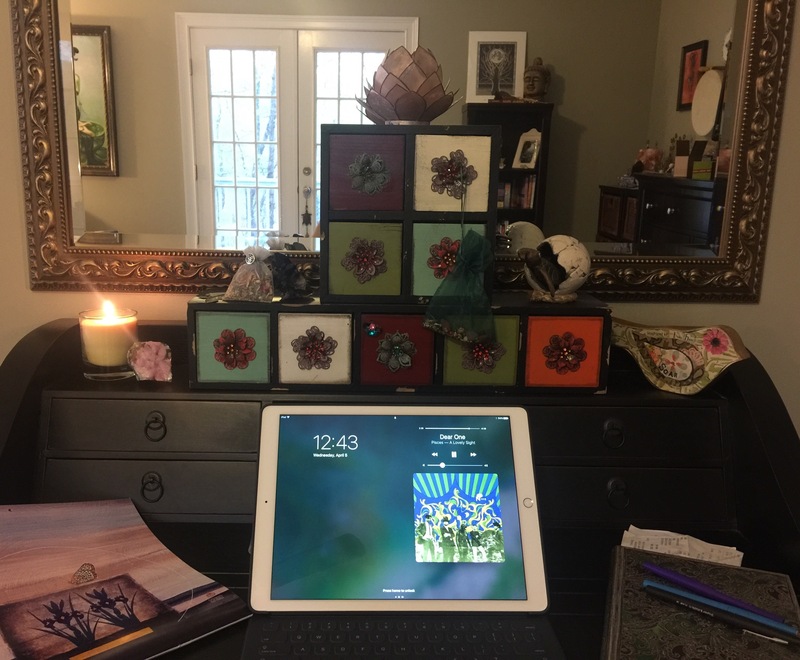 iPads, candles and Ayurveda… OH MY!! How setting up your space can ignite the fire of inspiration. A crucial aspect of creativity, for me, is setting the stage for inspiration to flow. In Ayurveda I am considered a straight up Pitta. We are fiery, driven and extremely passionate! About everything! I often tell people… I’m either passionate about something or I quit caring. It’s my nature and it helps me decide, fairly quickly, usually, what is for me and what is not. Pitta is a dosha and dosha is a Sanskrit term for Mind/Body constitution. It’s your unique inner magic, if you will. It’s what makes you you and gives you a roadmap to understand why you do what you do, like what you like, behave, react, respond and more. Ayurveda is the oldest healing system on the planet and is steeped in deep truth regarding our minds, our bodies and our Spirit. After all, Ayurveda means The Science Of Life. Knowing my unique make-up lets me observe myself with less judgement and reminds me that my way of doing things may not be at all how others, especially the different dosha types, go about their lives. In a world that often makes us feel shame or guilt for our differences, it’s comforting to know that almost 5000 yrs ago Ayurveda was telling us… you’re different, you’re unique, be you and here’s a guideline. To me, that’s really cool and has been a wonderful gift to help me become more self-aware, less critical of myself and others, and more kind to the way I do things. Today my nature showed up in the need to rearrange my desk in my bedroom. It was a cluttered mess, mostly used for hand writing cards to friends, however it was piled high with crap that kept me from sending those much-loved correspondence. I’m a little old school like that. I love pen & paper and stacks of cards tied with ribbon. Oops, my addiction is showing! Before I go down that rabbit hole. Here’s my current workspace. Yes, it’s partly an altar to my new iPad Pro 🤓 however it’s SO much more. It’s uncluttered, clear space and has elements to soothe the pitta mind/body. The space helps me create. My kids often say that I don’t really clean house, I just rearrange furniture. Definitely a pitta trait when we need to detox our mind. We need to move, clear and balance. My workspace also has cooling colors of green, blue & white to calm my fire, a candle to inspire, combined with the scent of organic sandalwood incense to soothe. A few other personal items finish off the space where now I know I can sit down and get creative. I hope sharing my space inspires you today to create space for your uniqueness. If my talk of Ayurveda piques your interest then be aware I’ll be posting more about it and also teaching an Ayurvedic workshop soon. May the fire of creativity spark your inner magick! Previous postHow are you spending your energy? Are you energetically aligned with success?